Love Delayed – It's Lily O.
Nope! Nein! Niet! No! As mentioned in my first post In Defense of Fans of Romance Novels, I dislike it when books take too drastic of a turn. In Love Delayed author, Love Belvin does just that. Reading this book took me from the heights of love and cheering on a burgeoning romance to wanting to torch my Kindle Paperwhite at the “end” in protest. The story of Elizabeth “Zoey” Barrett and Stenton Rogers in Love Delayed had the potential to be the greatest love story of all-time. ALL –TIME. I am not exaggerating; I am writing this with a clear and coherent mind. Instead, it turned into a cheap ploy to get the reader invested in a series based on a single couple. While I despise how Love Delayed “ended”, there were elements of the story that I enjoyed. The development of romance between Zoey and Stenton, realistic concerns and the climax development were all elements that I enjoyed while reading this book. The “ending” and the flashback structure were two things that I didn’t like. I like it when an author makes me fall for the male lead in a romance novel, but I love it when I am rooting for the couple as a unit. Love Belvin made me root and fall for Zoey and Stenton’s success as a couple. Love Delayed begins in the present with Elizabeth “Zoey” Bennett co-parenting her seven-years-old son, Jordan, with Stenton Rodgers. In a series of flashbacks, Love Belvin tells the story of how Zoey and Stenton come together. An unlikely match from the beginning, Princeton student Zoey and NBA superstar Stenton morph from friends to soulmates before the reader’s eyes.The slow build-up allowed me as a reader the opportunity to get to know Zoey and Stenton as individuals first and as a couple second. Belvin allows us further insight into their growth by allowing us to see their realistic obstacles. Age, family and future are all obstacles that Zoey and Stenton face while trying to navigate their love. Without revealing too much about the plot, they do so the only way they know how-trial and error. The obstacles blended in well and helped propel the story forward. While Stenton is an NBA superstar and Zoey is a Princeton student genius, the secondary plots ground the story in reality. Too often in romance novels the characters drift off into perfection that is simply not realistic. For example, a billionaire meets a model turned fashion designer/Pulitzer-Prize winning playwright-really? No one’s life is that perfect-even in Romance Novels. Love Belvin successfully navigates the line between fantasy and reality in a refreshing way. I can imagine that there is an NBA player that has been in this situation. Regardless of the “ending” Belvin did a great job of building up the climax and blending major turning points into the story. In the introduction, I mentioned my outrage at how Love Delayed “concluded”. After the appalling ending, I had to reread key parts to understand fully what happened. It became clear that everything was right there in reader’s face. How Belvin did this so eloquently, I will never know but she is talented in this regard. That being said-WHAT HAPPENED! The closer I got to the end I found myself reading slower in hopes that more pages would magically appear to conclude the story properly. When I skimmed over the synopses of Love Belvin’s previous works, I can only fault myself for how this book “ended”. Belvin’s previous series centered on a single couple for several books; my heart simply cannot take this. I like firm conclusions. Elizabeth “Zoey” Barrett: Young, but strong and smart. She didn’t fall into the damsel in distress trope. Stenton Rodgers: A nice mixture of rough-around the edges and sensitive leading man. 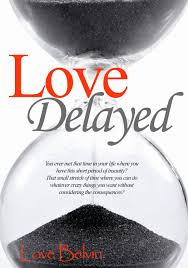 Love Delayed featured a nice mix of frenemies, family and friends that round out the story. While they include other NBA and reality stars, they come across as real people and not caricatures. The storyline kept me interested however the flashbacks muddled the story in some areas. As mentioned this story had the potential to be one of, if not the best love stories of all-time. Stretching a single love story out over more than one book left me feeling trapped as a reader. If you are someone who likes a Romance series based on a single couple, I recommend giving the Waiting to Breathe series a try. If you don’t like to read books that end without leaving the reader satisfied, I would sit this one out. According to Love Belvin’s website, the next book in the series is due to be released in November. Part of me wants to read to see what happens with Zoey and Stenton, the other part doesn’t want to risk being let down again. Pingback: First World Problems: Reading Edition | It's Lily O.
Pingback: Love Belvin: Love Delivered (Waiting to Breathe Series Book 2) | It's Lily O.